The North end of the slope works best with SSE to SSW wind. The South end of the slope works best with ENE to ESE wind. The center of the slope will work with SSE to ESE wind but the LZ at center slope is literally non-existent. Balboa Weather Eye, (talesofbalboa.com), 1.4 mi. S of slope near Balboa Pier. EW3141 Corona Del Mar (MesoWest), N. end of Upper Newport Bay aprox. 1 mi. SE of slope. John Wayne (Orange County) Airport, (MesoWest), inland 4 mi. NNE of slope. 60-70′ slope works well in moderate winds and really comes alive in stronger winds. Very limited LZ but not much rotor up top. No DS potential. Recovery can be tough because the slope is steep and there is lots of cactus, especially on S. end of slope. Very little beach at the bottom during high tide but the beach is accessible from Polaris Drive. 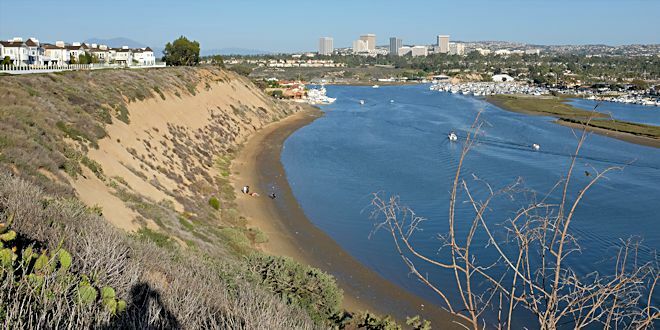 The LZ for this slope is very limited and is bordered by some of the most expensive real estate in the Newport-Mesa area. All possible care should be taken to keep your planes on the bay side of the bicycle path because most of the residents on the other side of the path (and locals who use the path) aren’t exactly supportive of our hobby. Consequently, this isn’t a slope for inexperienced pilots. Go North on Dover Dr. for 0.7 miles to Westcliff Dr. and turn RIGHT. Go E. on 17th St. for 1 mi. to Dover Dr. and turn LEFT (stay in right-hand left turn lane). Go N. on Dover Dr. 200 ft. to Westcliff Dr. and turn RIGHT. Go E on Westcliff Dr. about 100 ft. to the stop sign and turn RIGHT. Continue SE on Westcliff Dr. for 0.3 miles to the stop sign (Santiago Dr.) and turn RIGHT. Go W on Santiago Dr. for about 100 ft and park in the corner. Walk W up asphalt bicycle path, turn LEFT at Tee intersection, and follow bike path S to the slope. 33.61625, -117.90701 – Junction Pacific Coast Hwy. & Dover Dr.
33.62567, -117.90357 – Junction Dover Dr. & Westcliff Dr.
33.62294, -117.89974 – Junction Westcliff Dr. & Santiago Dr.